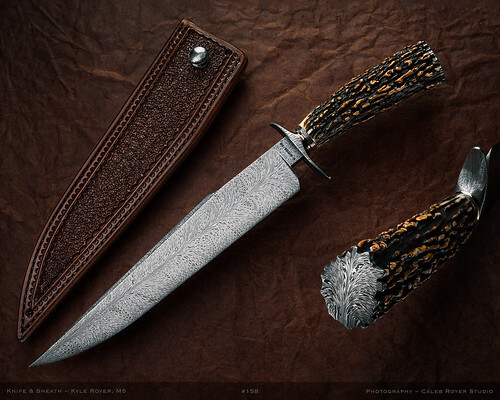 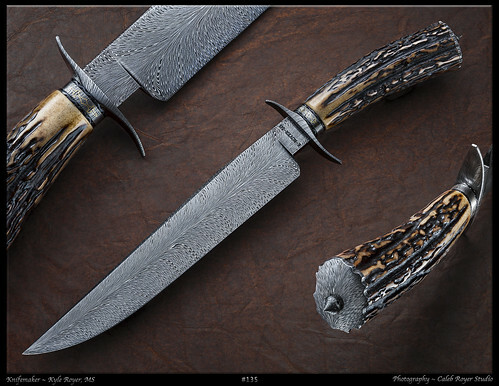 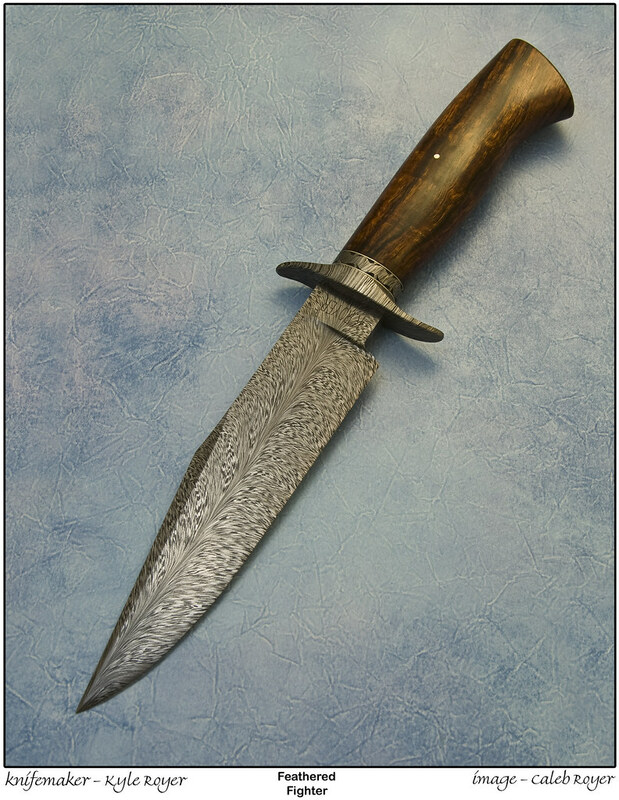 10″ blade of West Texas Wind damascus. 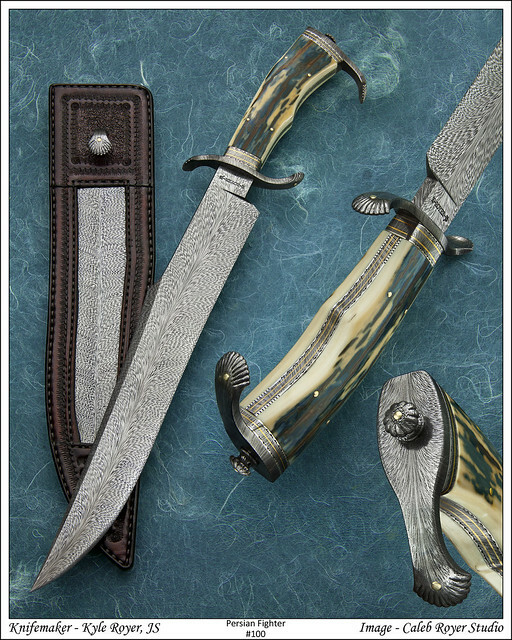 Premium Mother of Pearl handle scales. 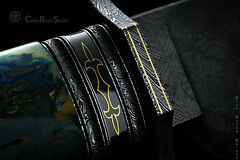 24K gold inlays and domed pins. 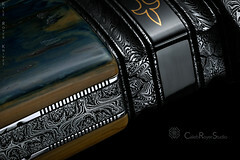 French Greyed engraving on frame and front spacer. 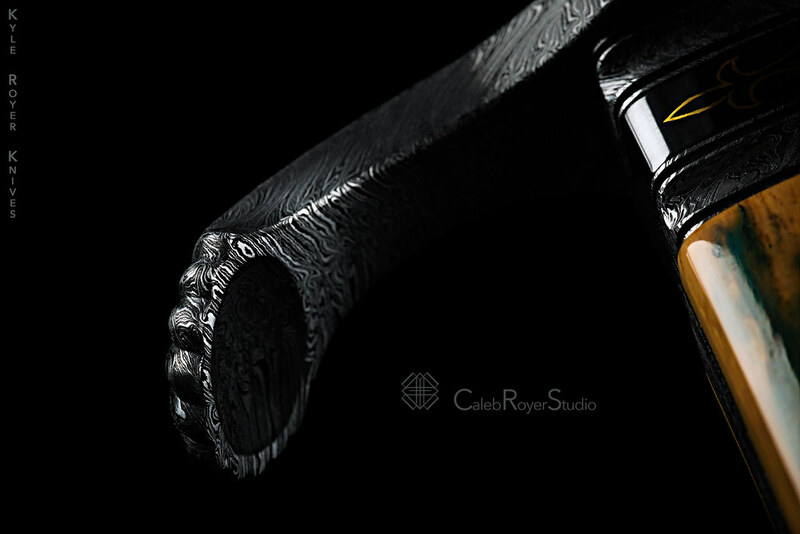 Extra deep sculpted clamshells on guard and rear bolsters. 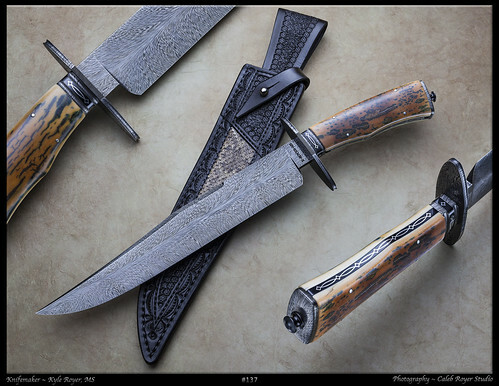 Full take down double-edged fighter. The 6 1/2″ blade is a W Ladder Pattern. 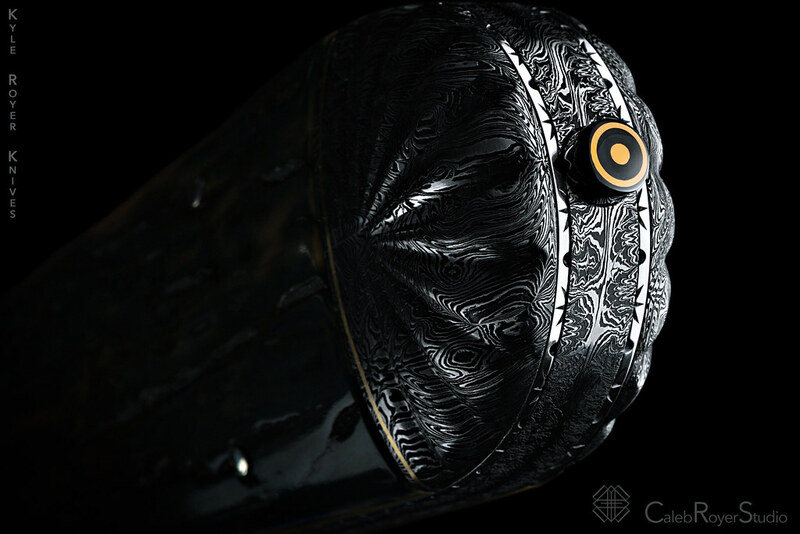 The handle is ebony with cross hatching and 36 domed tacks. The three piece spacer is of fine ladder damascus and stainless steel with grooves and coining. 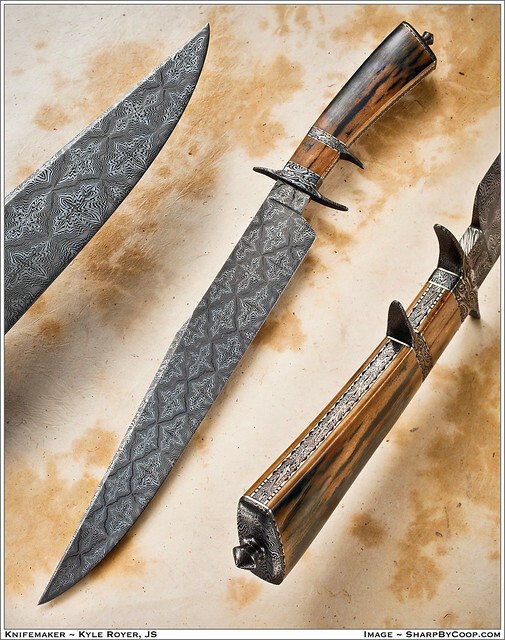 The guard is sculpted ladder pattern damascus. 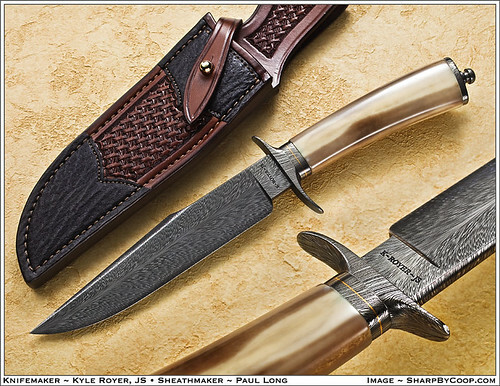 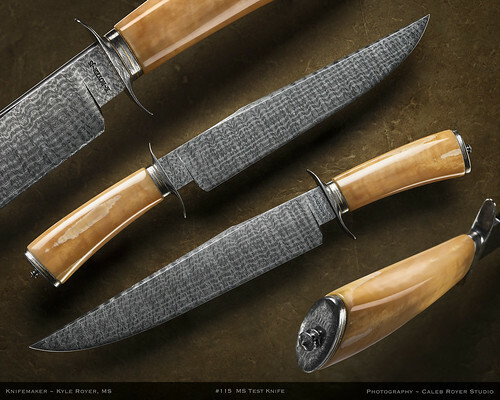 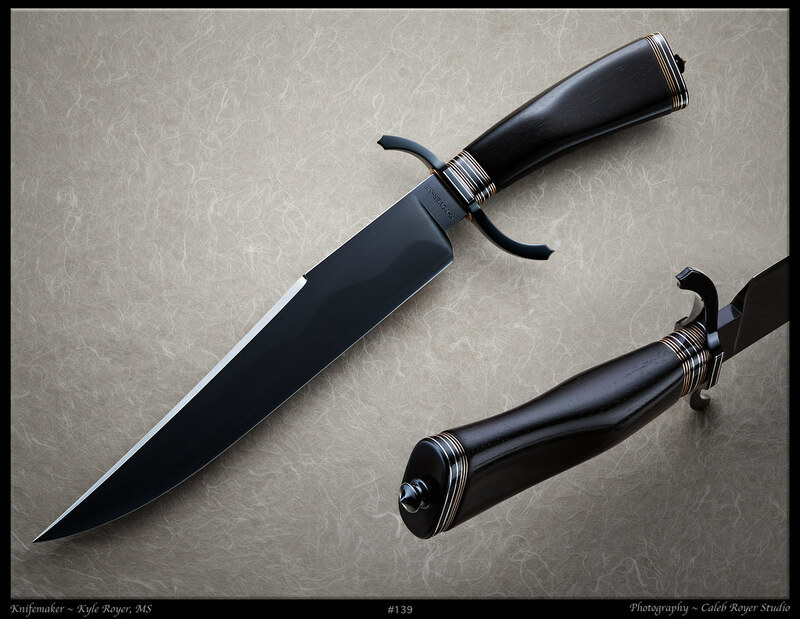 This knife has a deep hollow ground double edged blade in the Loveless style and a frame handle. 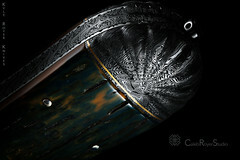 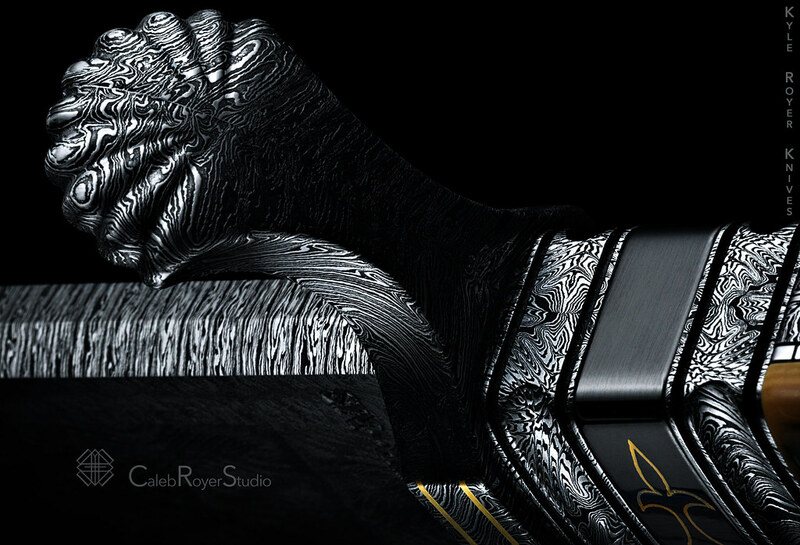 The blade is of a tight “W” Feather pattern Damascus as are the fittings. The scales are of premium Alaskan Mammoth Ivory, the domed pins are German Silver. 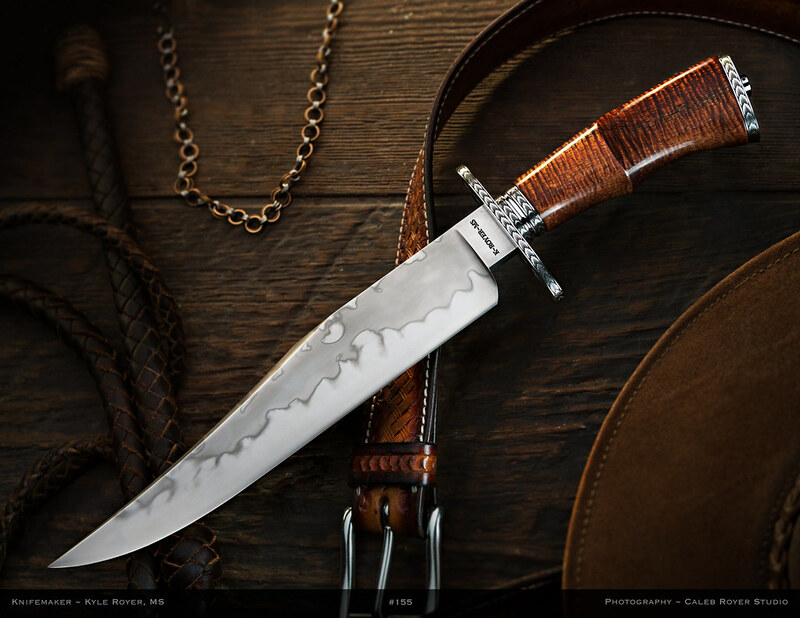 I also made the Leather sheath. I heat treated the fittings so they would etch darker. 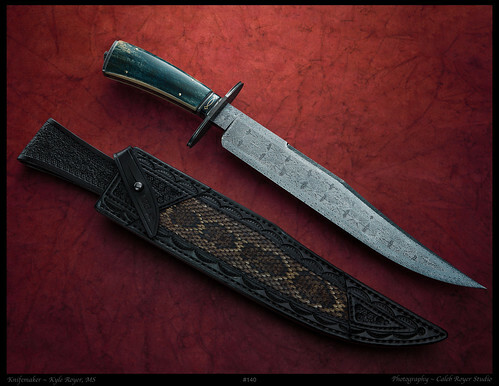 This is my one hundredth knife and my forty ninth sheath. 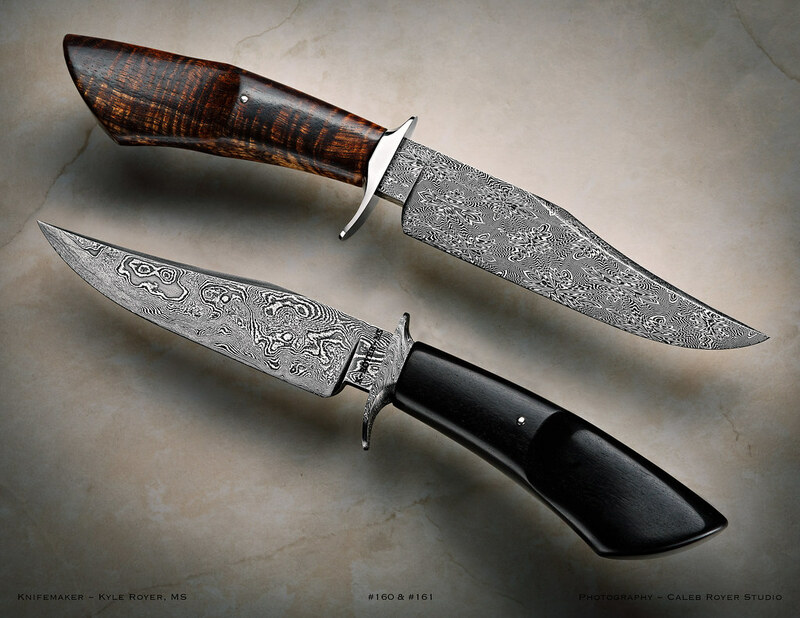 The 12 1/4 inch re-curve blade is “W” Feather Pattern Damascus as are all the fittings. This is the longest feather pattern blade I have made to date with the previous being 9 inches long. 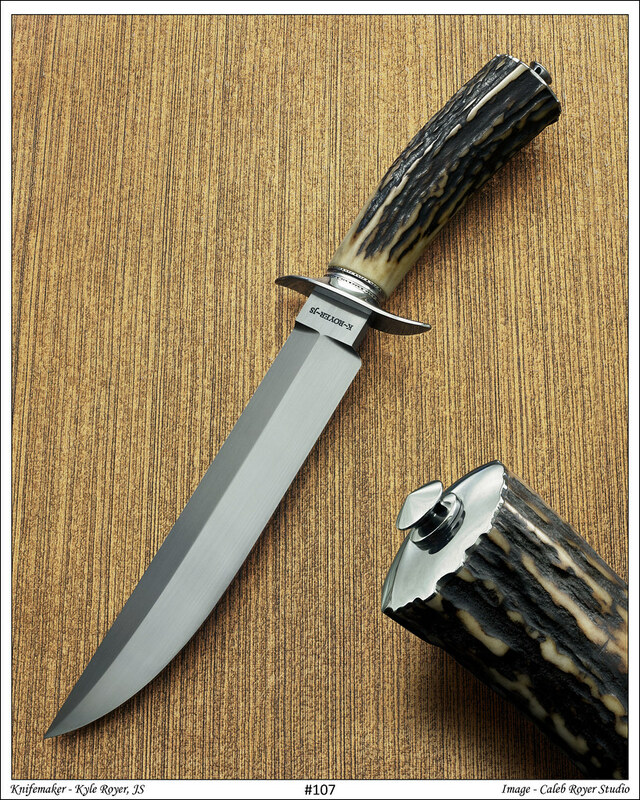 The handle is premium Alaskan Mammoth Ivory. 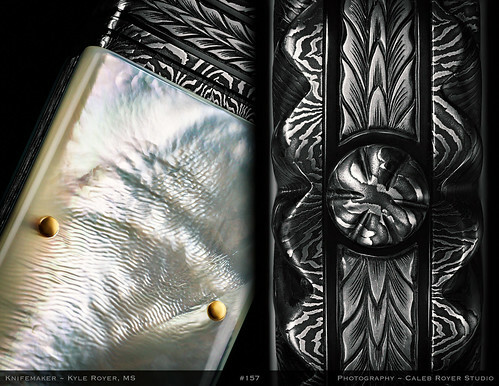 The domed pins on the clam shells and the handle are 18K gold. The frame on top and bottom have 24K gold inlays as do the front and rear spacers. 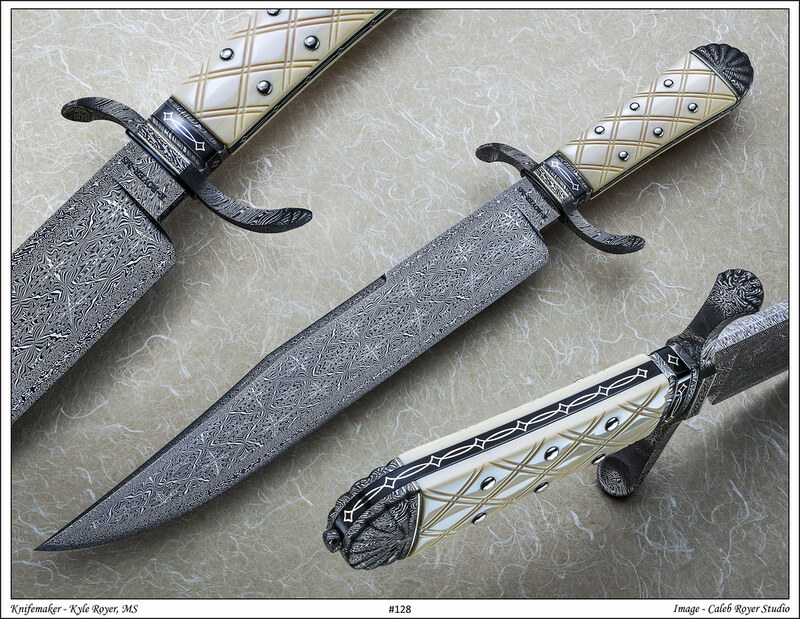 There is a total of 25 inches of 24K gold in the fittings which is the most I have done on a knife. 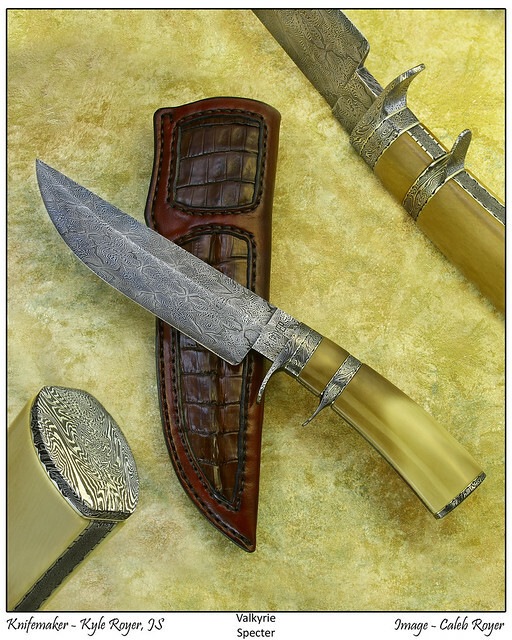 There are German Silver liners with file-work on them surrounding the handle frame and damascus spacers. 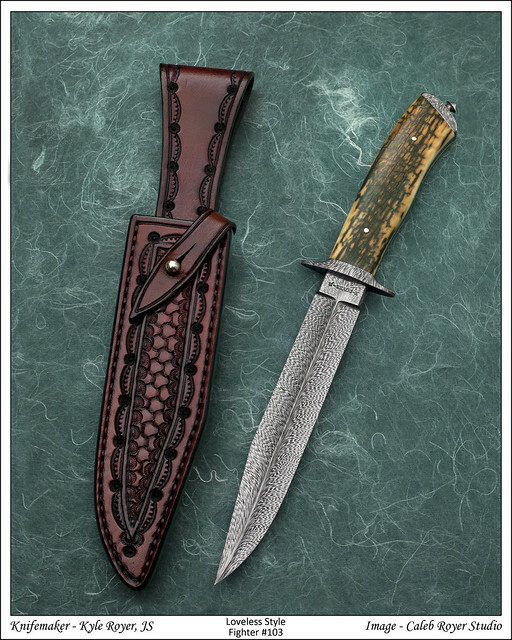 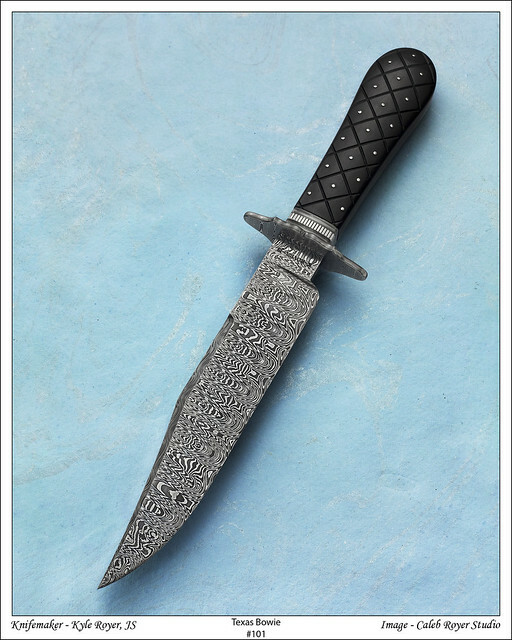 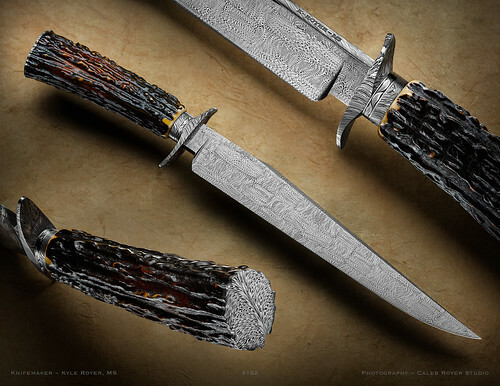 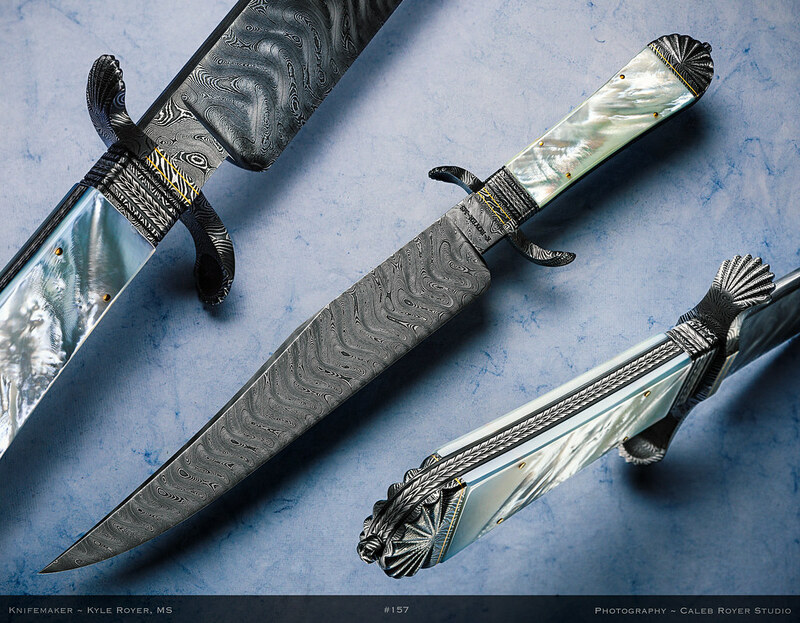 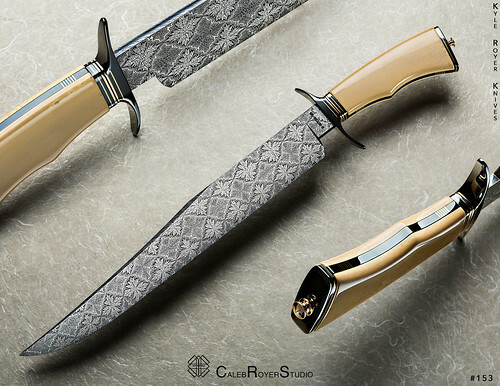 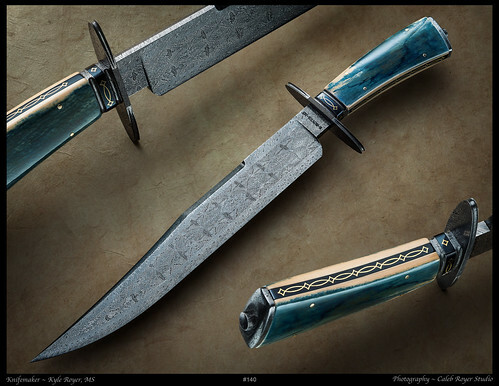 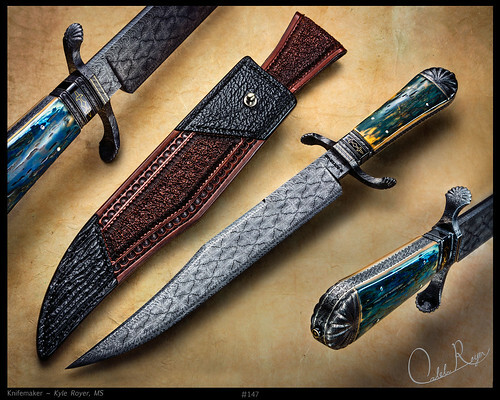 The 6 3/8 inch double-edged blade is forged from 1080 and 15N20 in a “W” Basket Weave Mosaic Damascus Pattern. The overall length of this Vest Fighter is 10 7/8 inches. 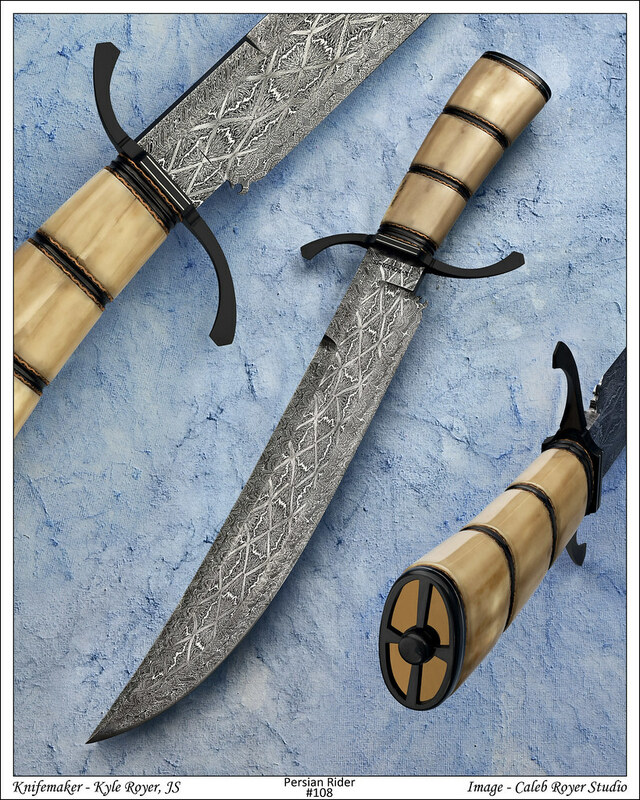 The blade is a unique design for me due to the fact that it was forged from a damascus pattern that I have not made before and it has a fuller on both sides. 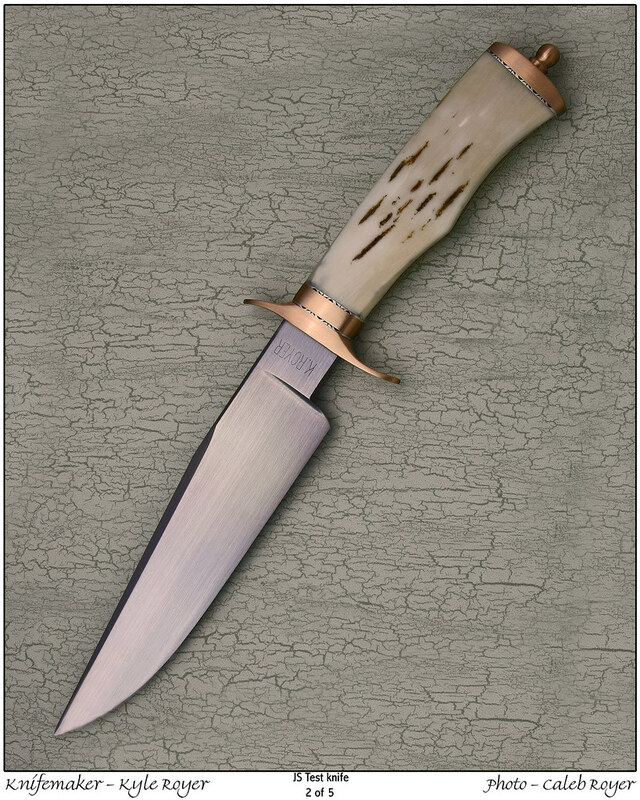 The handle is made from Alaskan Mammoth Ivory. 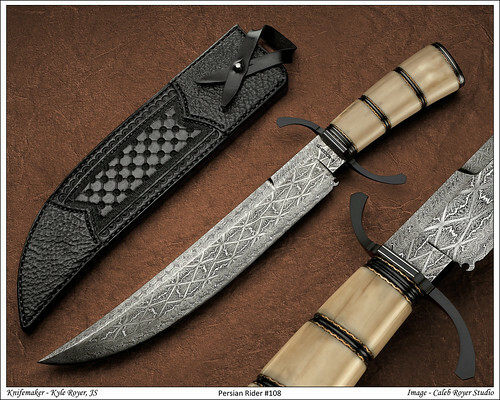 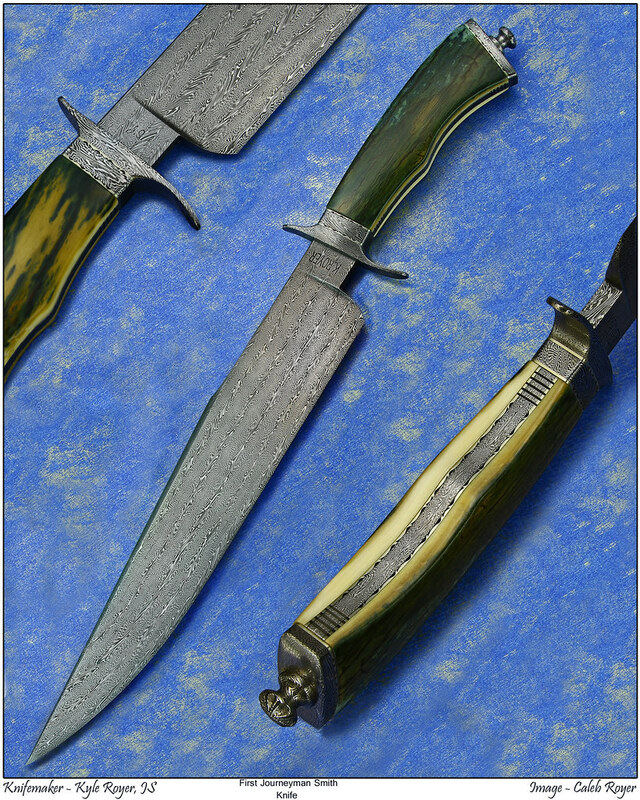 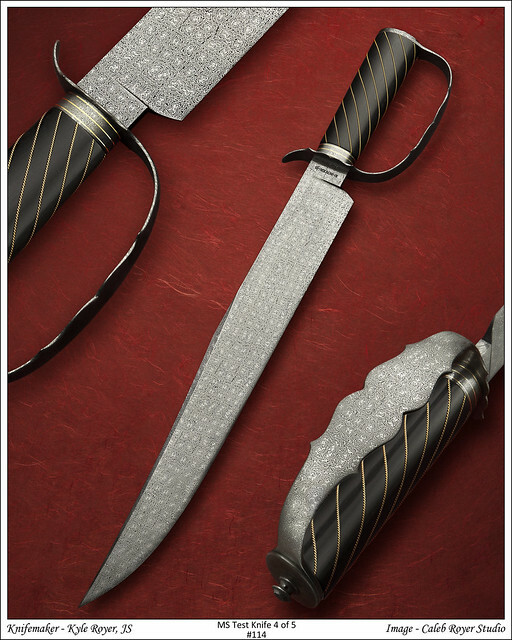 The fittings are of the same damascus pattern as the blade and the coined liners are of German Silver. 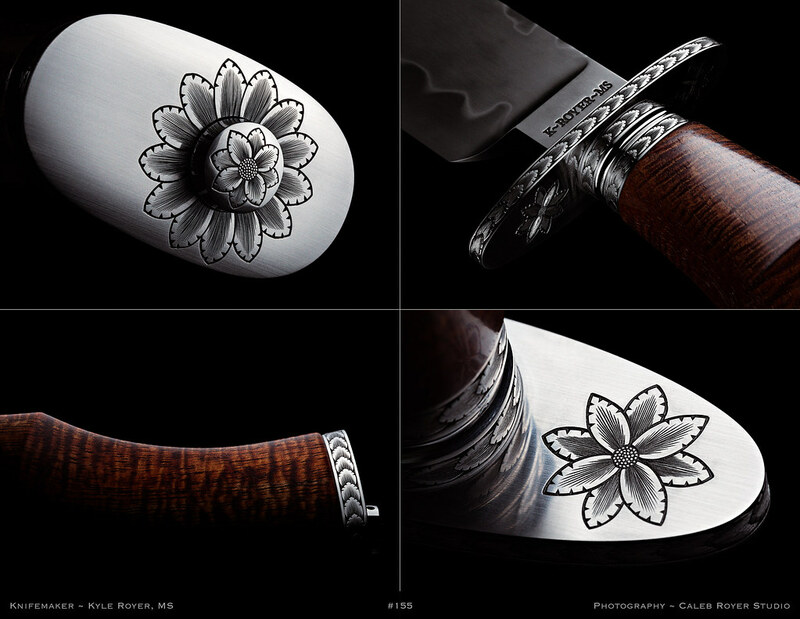 The pommel, spacer and frame have been border cut. 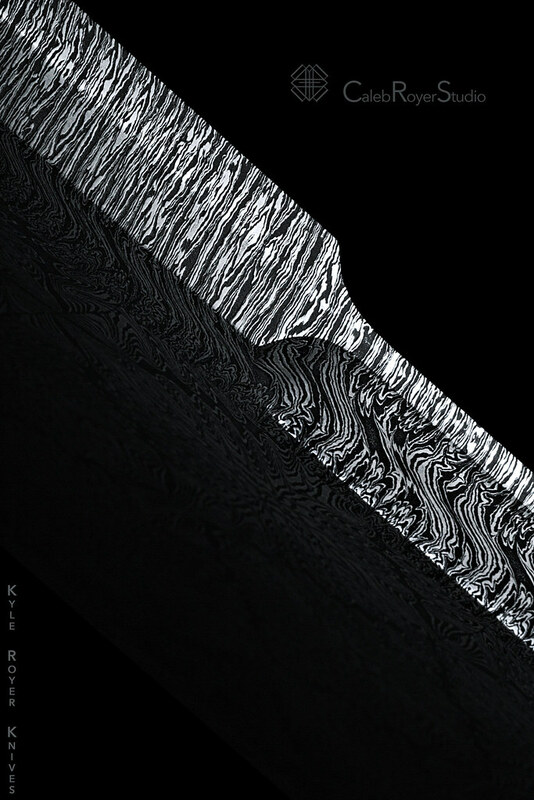 The damascus pattern in the blade has the most chatoyancy/shimmer I have made to date. 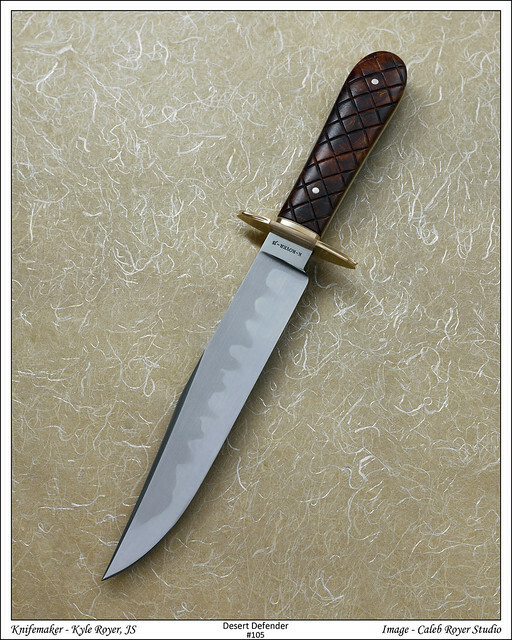 This knife is the 99th knife I have made. 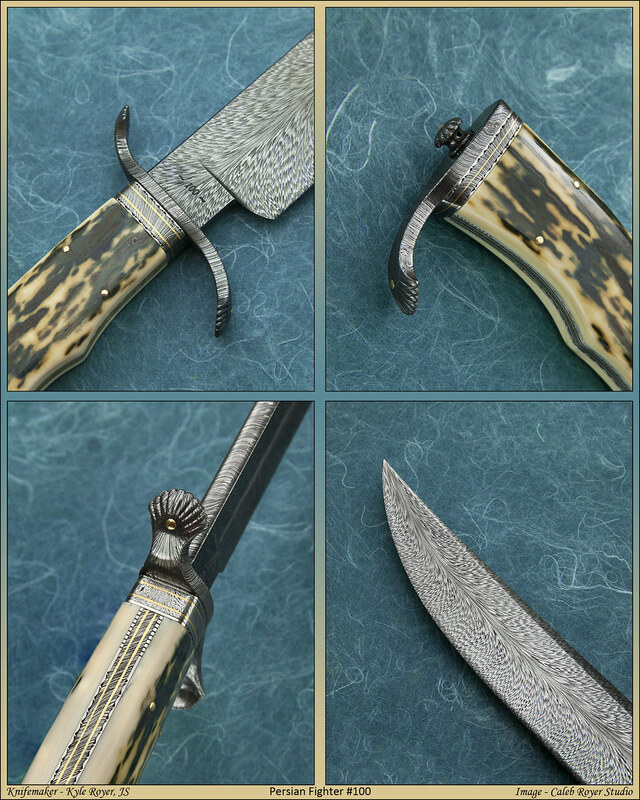 Here is my most recent knife. 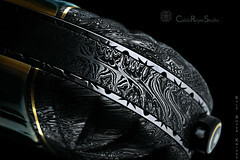 It is the second Sub-Hilt that I’ve made and has a forged 6 1/2″ blade of “Modified Starburst” Pattern Damascus. 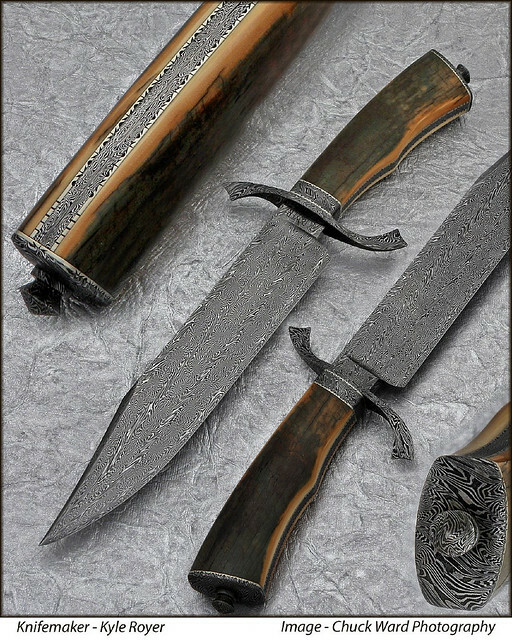 The fittings are of “Explosion” Pattern Damascus with German Silver liners that have Vine and Thorn Pattern File-Work on them. The handle is of Alaskan Mammoth Ivory. 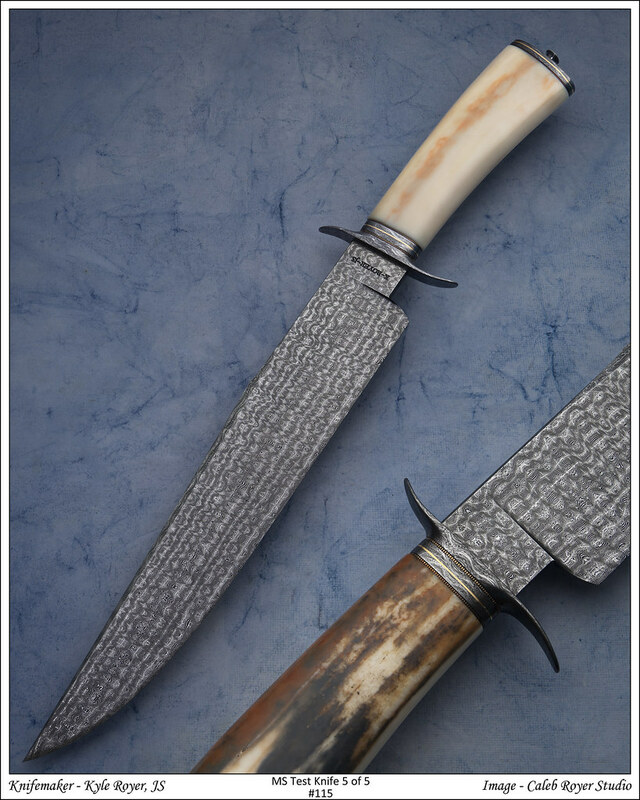 I also made the sheath for this knife and it features an Alligator Tail Skin Insert. 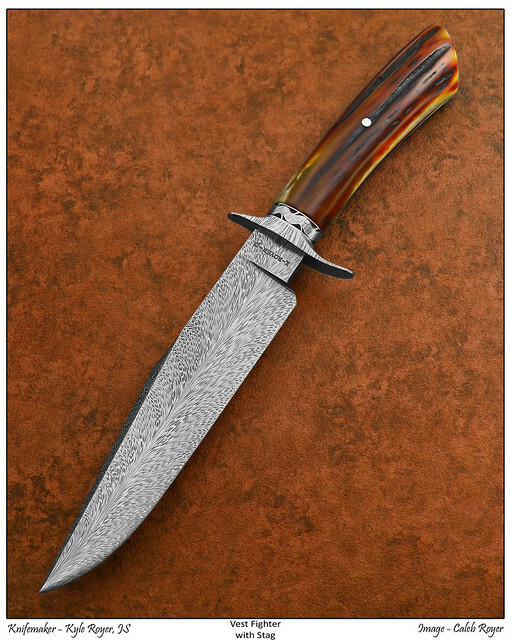 Here is the first knife I’ve made as a Journeyman Smith. 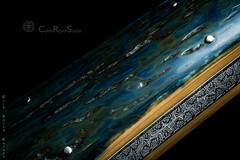 The handle is of Presentation Grade Fossil Mammoth Ivory. 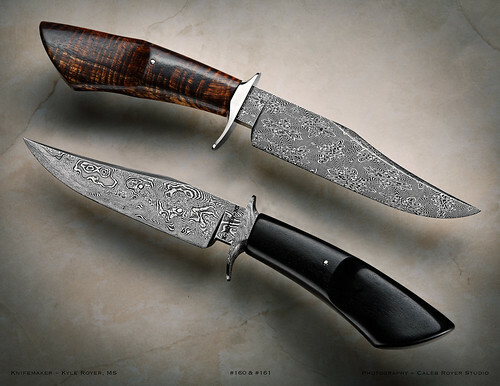 The 10″ blade is forged from 1080 and 15N20 in six bar “Explosion” Pattern Damascus. The fittings are of Damascus and German Silver for the liners. 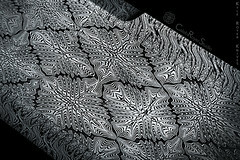 The liners have “Vine and Thorn” Pattern File-work on them. The overall length is 15″. This was the last fixed blade knife I made before receiving my JS Stamp from the ABS. 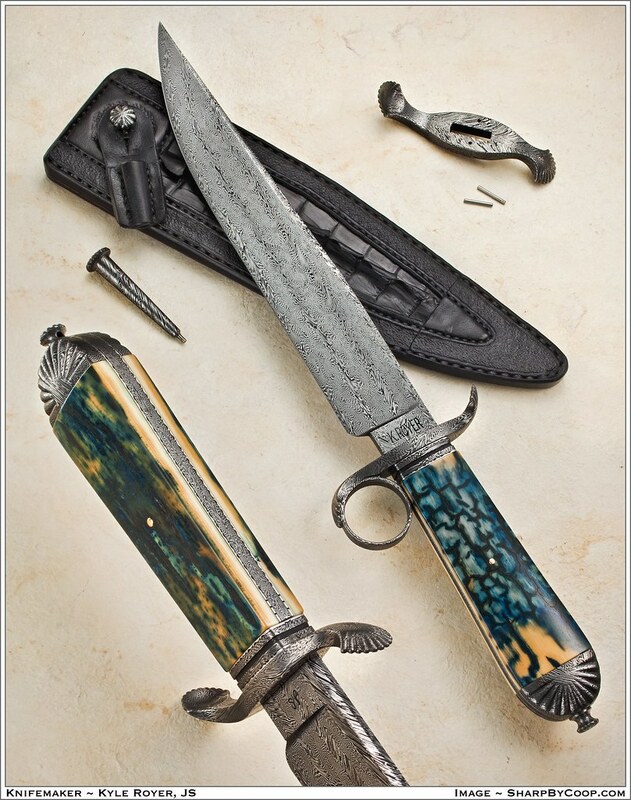 It is a Sub-hilt fighter with a 11 5/8″ blade that has been forged from 1080 and 15N20 in “Modified Star Burst” pattern damascus. 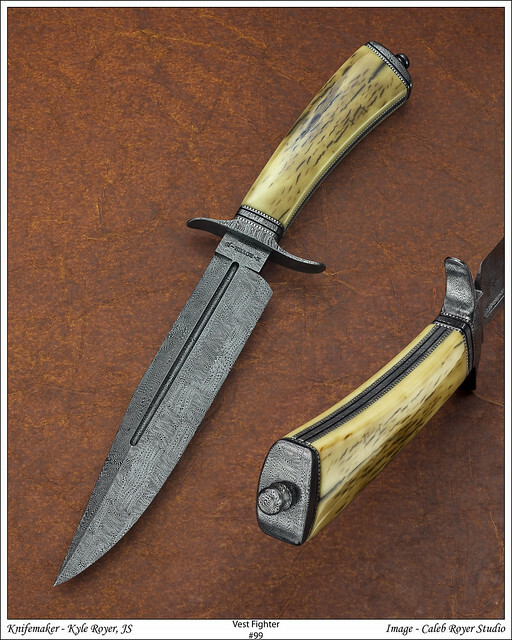 The handle if of Mammoth Ivory. 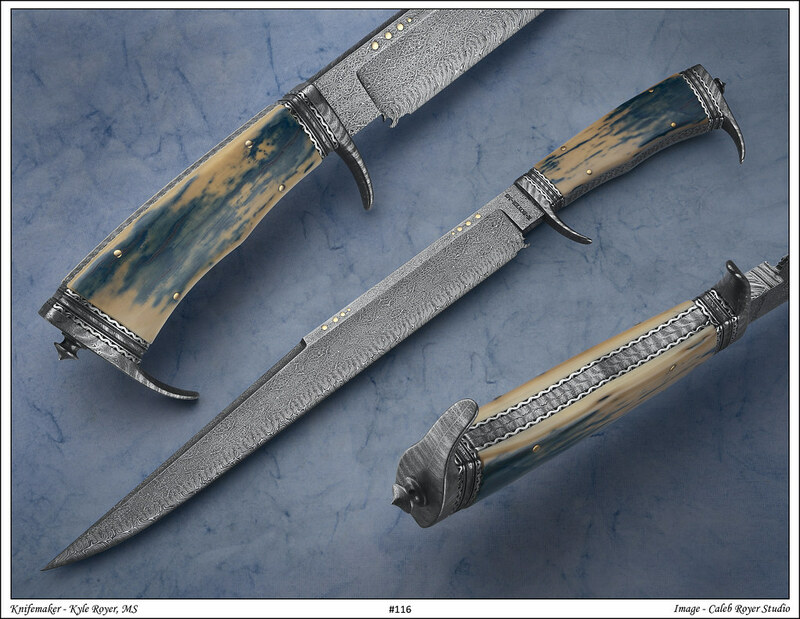 This is my first Sub-hilt knife. 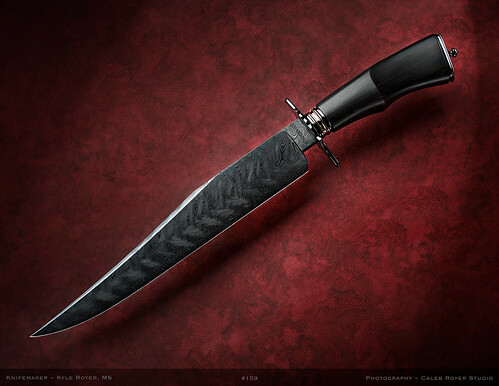 The 9″ blade is forged from 5160. 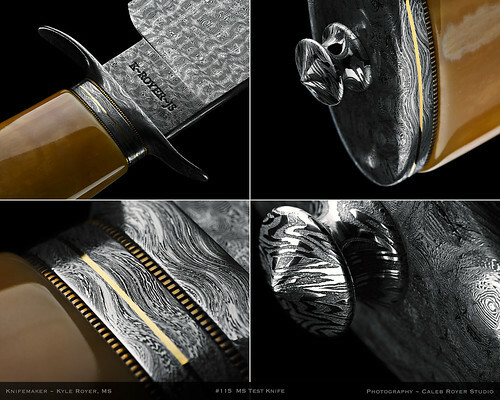 The handle is of Amber dyed Sambar Stag. The fittings are German Silver with Rope Pattern File work. 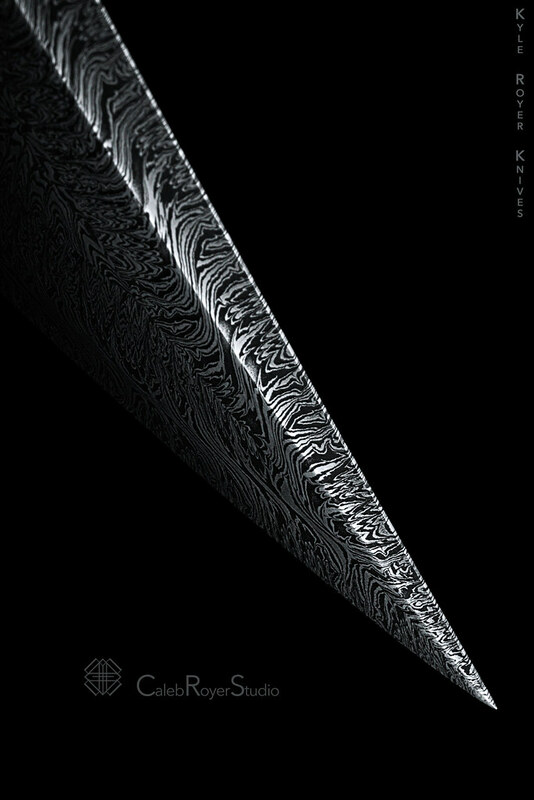 The blade has a 1500 grit finish on it. 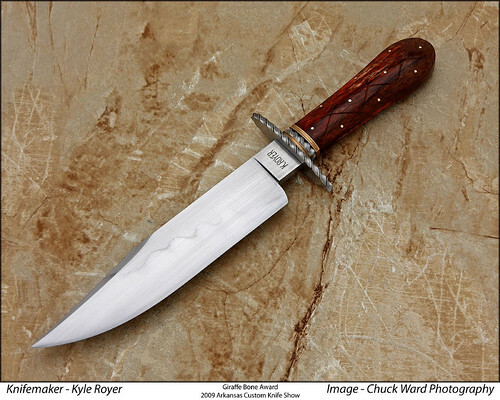 With this knife I won the Best Giraffe Bone Handled Knife award at the Little Rock AR, show February 2009. This knife has a 12″ 5160 blade, German Silver fittings, African Blackwood handle and an overall length of 16 3/4″ long. This is the second D-guard Bowie I’ve made. 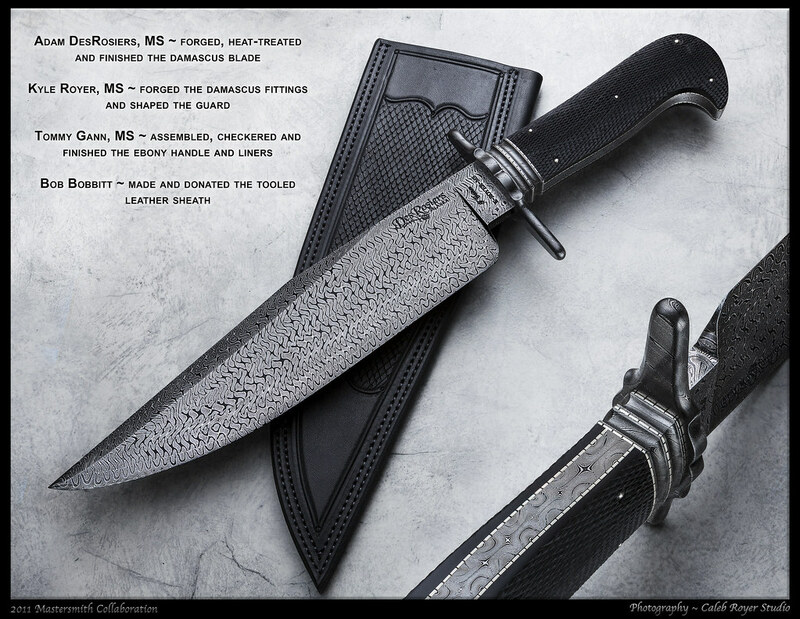 I will be using it for one of my JS Test knives at the Blade Show coming up. 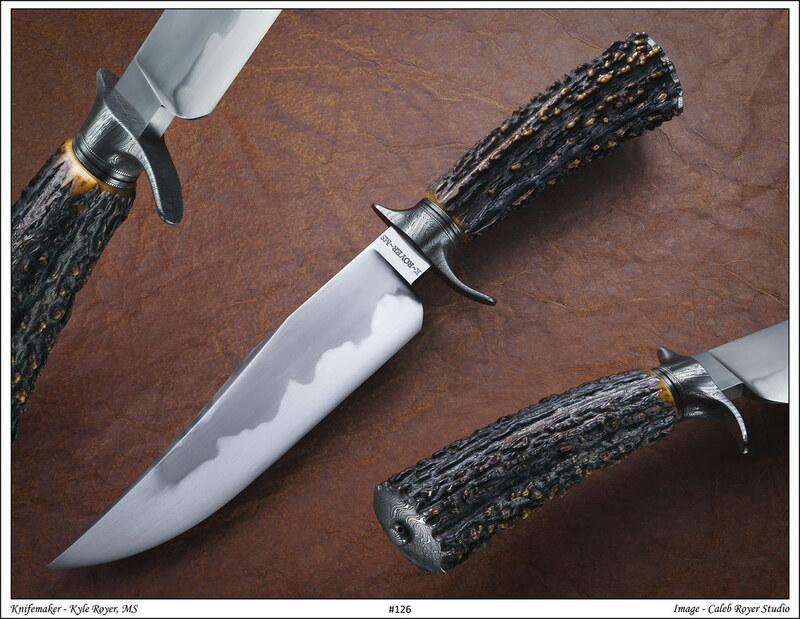 Here is the second knife I’ve just completed to use for one of my JS Test knives. 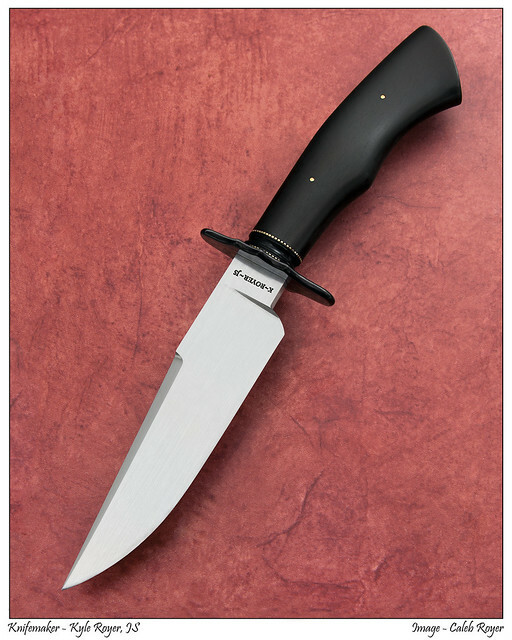 This knife has thirty pieces total, fourteen of them are internal line up pins. 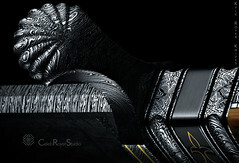 The handle is set up in a frame style configuration. The fittings are Silicon Bronze and German Silver. 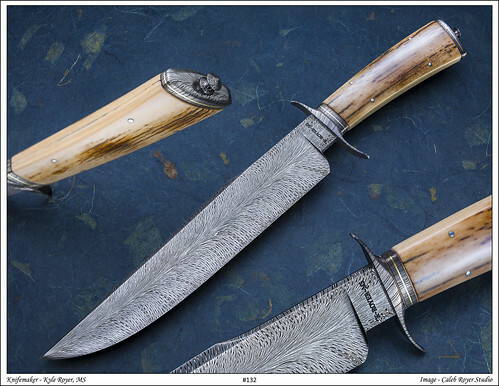 The handle is made from Mammoth Ivory. The 6 1/4″ blade is forged from 5160. 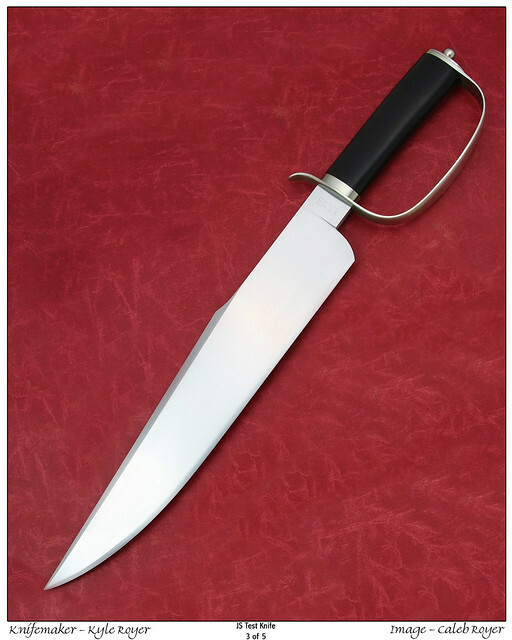 The overall length is 11″ long. 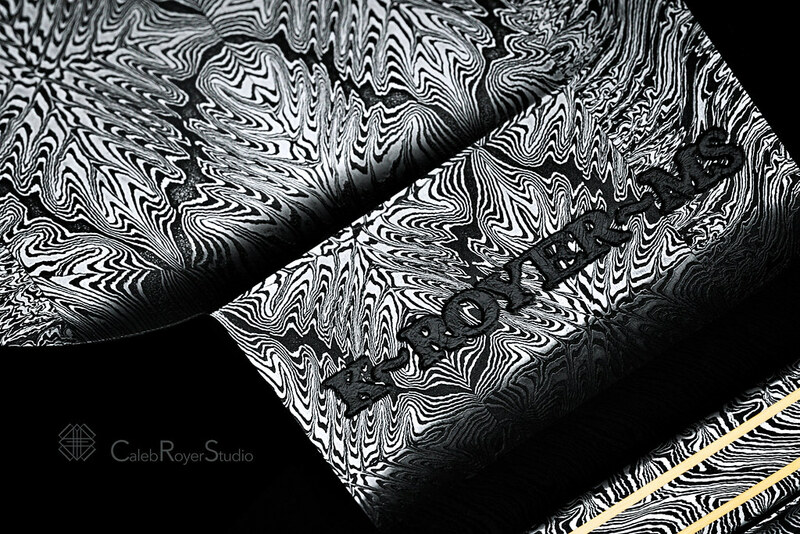 The German Silver Liners are 0.032 thick and have Star Burst Pattern File-work on them. With this knife I won the Best Damascus award at the Little Rock Show, February 2009. 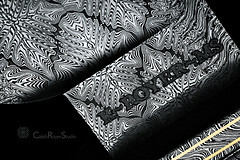 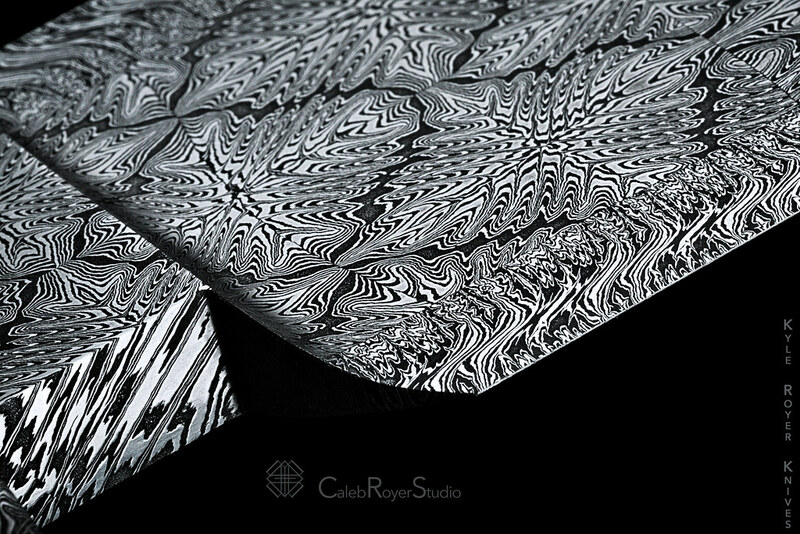 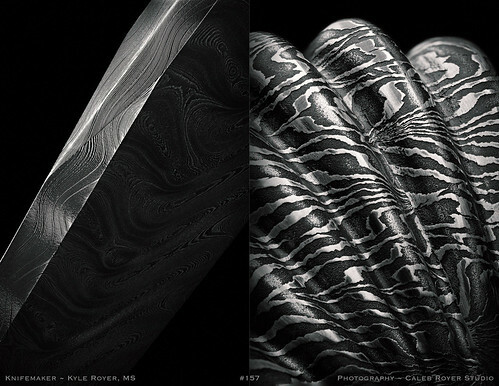 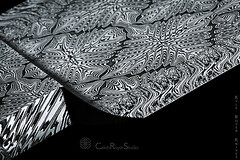 The 6 1/4″ blade is forged from 1080 and 15N20 in “W” Feather Pattern Damascus. 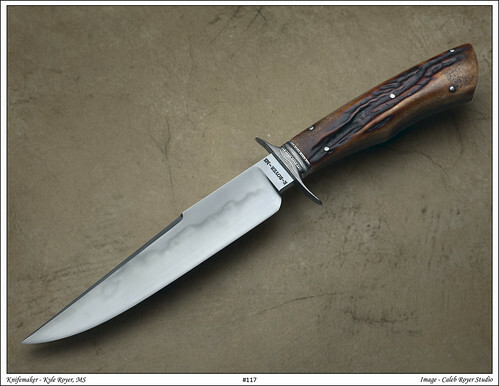 The handle is Desert Ironwood. The fittings are “W” Feather Damascus and German Silver. The overall length is 10 3/4″. 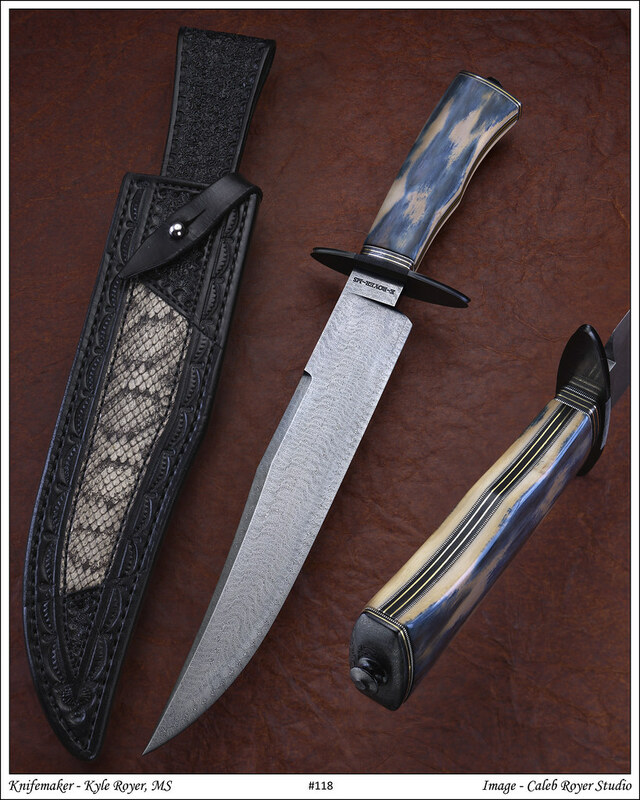 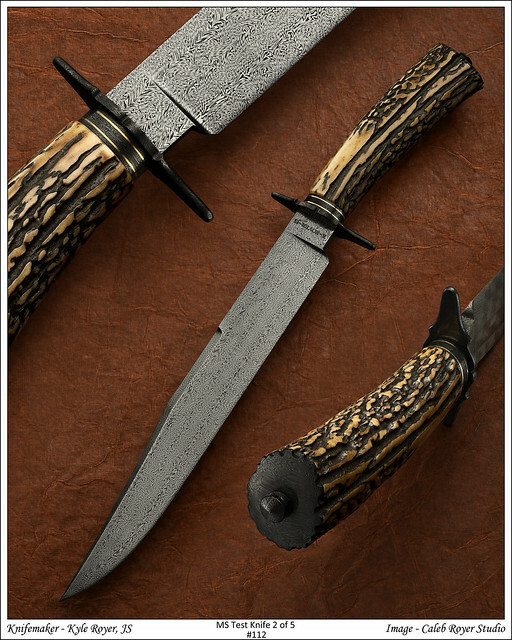 The 8 1/2″ blade is forged from a four bar composite, in Explosion Pattern Damascus. 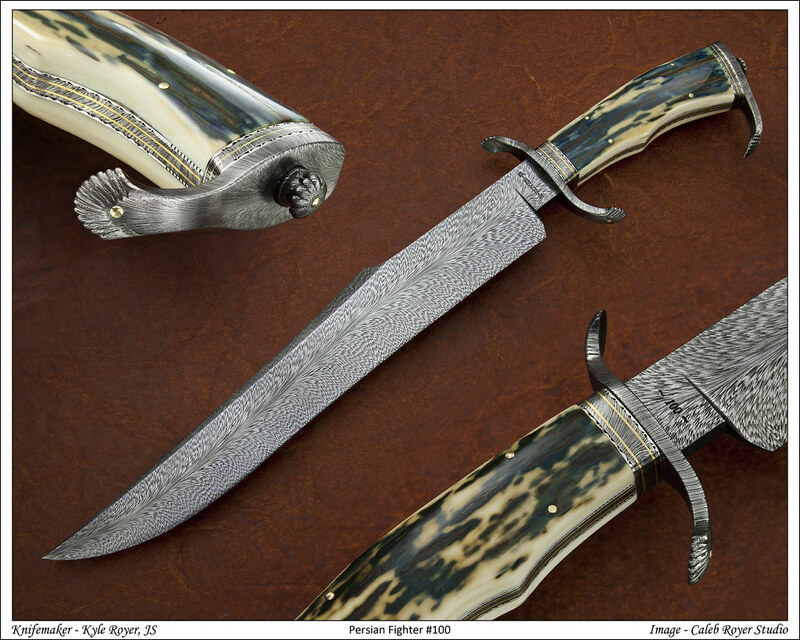 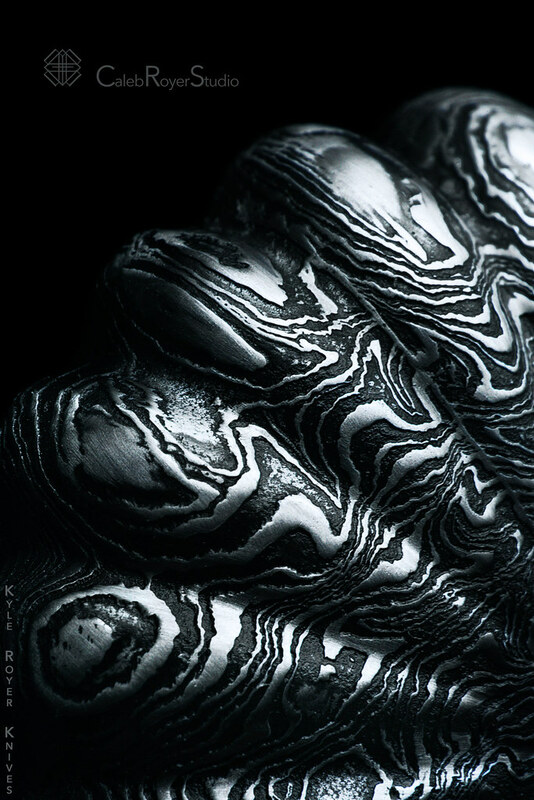 The fittings are Explosion Pattern Damascus and German Silver. 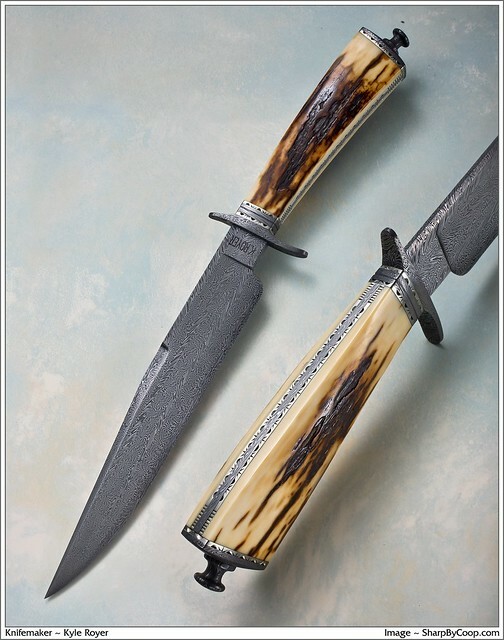 The handle is of Mammoth Ivory. 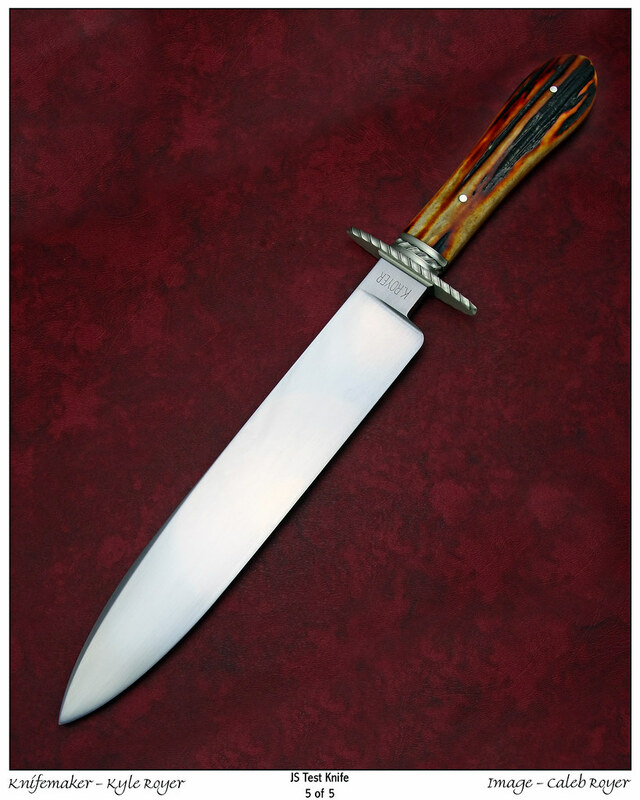 The overall length is 13 1/2″ long.